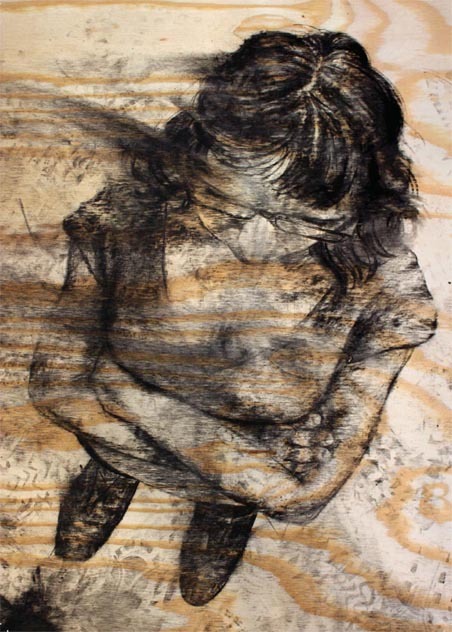 The gallery floor is covered in charcoal portraits. The portraits are drawn from a bird’s eye view, as if looking down at a mass of mingling people from above. It could be you. We are socially conditioned to treat artwork as precious and sacred – we speak softly in museums, we maintain respectable distance, we are never to touch the work. The museum as sanctuary; the museum as mausoleum. This piece is the opposite of untouchable art. You enter the space, you walk around, you smear the charcoal under your feet. Activating the space means wiping out the drawings. Or perhaps you are adding to the drawings through movement? The art exists only through its own obliteration. Movements, flows, currents. Indian Jewelers, Pakistani Construction Workers, Chinese Prostitutes, British Expatriates, Nigerian Merchants, French Culturalists, Filipino Maids. Stereotypes. Demographics. How do those residing in Hong Kong relate to each other? Are we a heterogeneous society, or a homogeneous one? What does it mean, ‘to assimilate’? I am interested in maneuvering relationships. My medium of choice is human interaction. The intention is to pose questions, though I offer no solutions. I am concerned with creating a space for viewers to discuss issues that may seem larger them themselves. As a rigorous archivist, every alteration of the piece will be documented and presented as part of the work. As a process-oriented practitioner, the closing critique session is expected to be an indispensable part of the project.